We are several weeks into spring and I am thrilled to finally see the green grass and the trees begin to bud. Our weather can be fickle and it's not uncommon to have an occasional snowfall so I'm happy to finally be able to wear my spring outfits. This year and this year the spring trends are hotter than ever! I'm loving all the floral prints, and pastel clothing, especially blush. My family even wore blush Easter outfits. 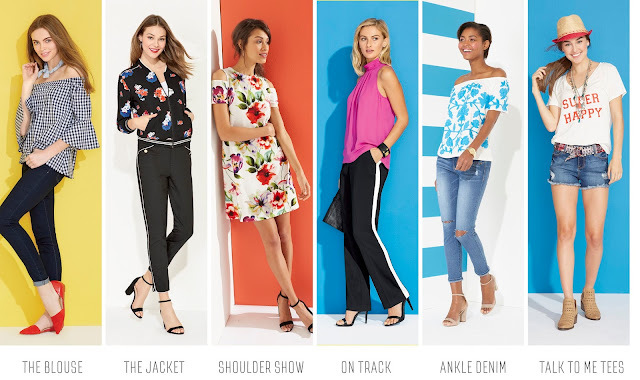 Speaking of spring fashion trends, have you seen the new spring collection at Herberger's? The New & Now collection at Herberger's is all about what's hot this season. All of these spring styles are easy to pull off. What I love most about it is that they can also be found in plus sizes! The Blouse - It's all about blouses with lace details, poet, and novelty sleeves. Ruffles are also on trend this Spring. 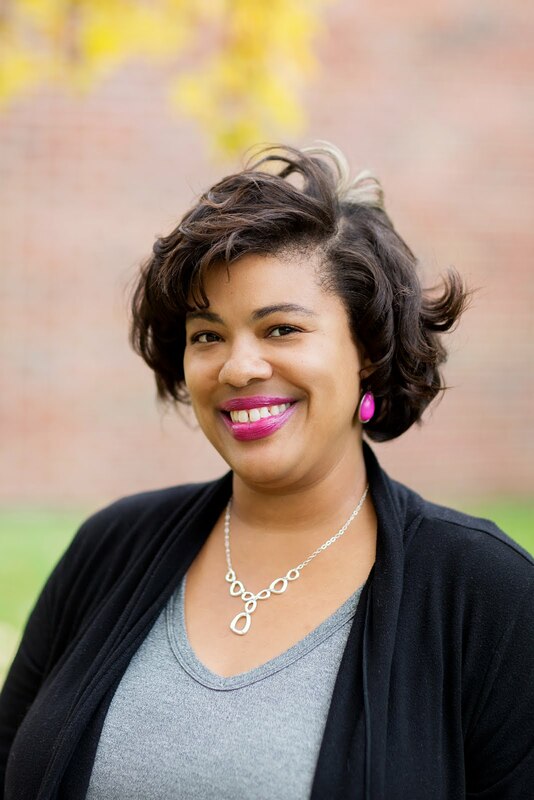 Here, I'm wearing an A. Byer blue v-neck shirt with lace detail. When I turn around, you can see the cut outs in the back. I like them because they're flirty yet still modest. The Jacket – Utility, Motto and Denim jackets are a fashion staple this season. Bombers are super hot and you'll want to jump on this trend asap! Above, I'm wearing the Relativity Plus Size Floral Printed Bomber Jacket with pink and white flowers which I think is perfect for cooler spring days. Go Global – (See above) Is anything that is global inspired. Fedora hats, lace up shoes, tassels, beads, and pom-poms are perfect for completing your spring look. Embroidered denim and patches are also all the rage right now. On Track – (See above) Track pants and leggings with racing stripes are also something to add to your spring wardrobe. You can dress them up with heels or rock them with a t-shirt and sneakers. Shoulder Show - Off the shoulder blouses and dresses continue to rule this year, and now cut out sleeves or split sleeve detail are showing up on the scene. This was the very first piece that caught my eye. The colors are perfect for spring. I'm loving the off the shoulder trend and I like the idea of straps to keep my top from sliding down too low. 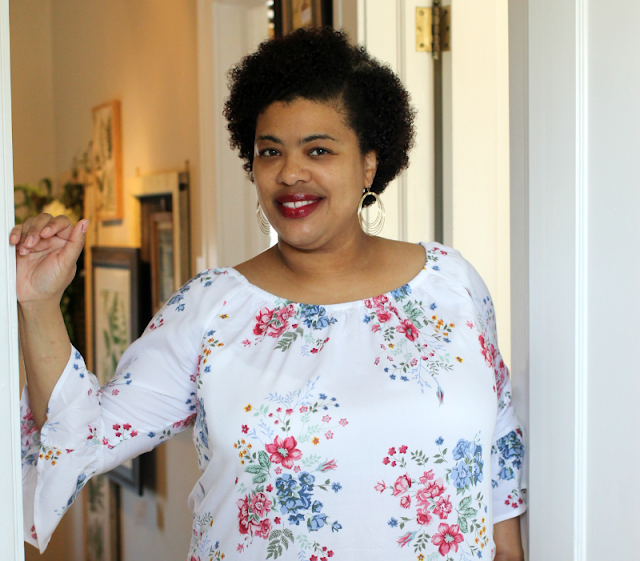 This one is A. Byer Plus Size Floral Off-Shoulder Top. Ankle Denim – Ankle denim is back again this season. Look for ankle details like raw and frayed hems, and cuffs. Rolled and embroidered hems are a chic too. 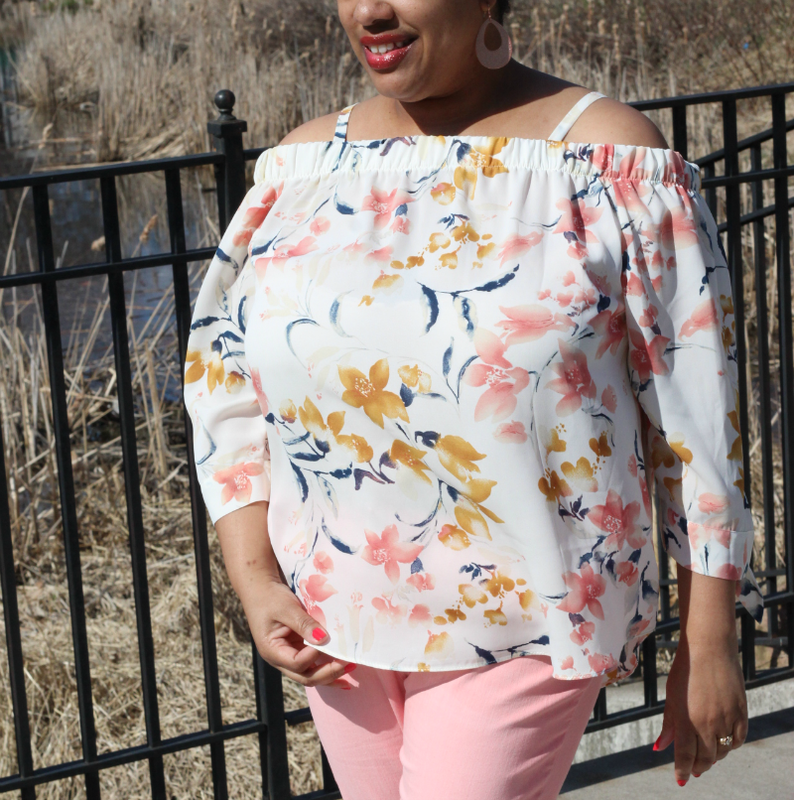 I'm loving the Celebrity Pink Plus Size Released Hem Jeans. City Sandals – This season's number one shoe trend is the block heel and this strappy sandal will take you from spring to summer. This style takes the polish of a stiletto and pairs it with a heel you can actually walk in. It’s so much more practical for everyday use, work, or the weekend. Talk to Me Tees – Express yourself with a graphic tee. This is a trend that I don't see going anywhere anytime soon. I chose this Eyeshadow Super Happy Tee because hey, life is good! Bon-Ton's blog and by following the #Bontonstyle and #LoveStyle on social media. What's your favorite New & Now trend this spring? This post is sponsored by Herberger's but opinions are always mine! I love the pinks on you and that off the shoulder top is perfect. Enjoy! I'm loving the off-the-shoulder and cut out sleeve tops too! I bought about four tops with that detail. I love the looks you're featuring here. The off-shoulder outfit really looks good on you - nice color food type skin, from head to toe. Thanks Petula! You know I love pinks. I've always wondered how I would look in a floral print. I'm not sure I can swing it, but you pulled off these prints very well! That floral jacket is the best. I love the off the shoulder top too. All your outfits are well put together. Great post! I'm ALL about the talk to me tees! Graphic tees are my go to these days, and they always do a great job of saying exactly what mood I'm in at any given time. I agree. Graphic tees can speak volumes! I love this post! You can just grab me one of each. I love the florals! Those distressed jeans are the cutest. I love the back of the top too. I'm not brave enough to wear a floral jacket but it is cute. You look cute and stylish too. I like the tops the best, they look very comfortable. The floral bomber and floral cold shoulder top are cute. I also love the pants you've paired with the latter. Great sense of style, mama. I love love love Stacie that first Spring outfit on you. It is so awesome I love that print on paired with those pants. You get it girl! #productreviewparty have an awesome week! Great minds think alike! That bomber jacket is hot!!!! Love it! I love all the outfits you're wearing. Love your style girl! I am loving that jacket and also the white shoes. These are lovely pictures and the looks are hot! I love that "cold shoulder" look and especially the one you are rocking here. Floral prints are back and I am loving them all! Loving the floral bomber jacket. I'm really loving this feminine touch on the jacket.